http://newiprogressive.com/images/stories/S5/eric-genrich-wbay-announcement-s5.jpg Announces he will not seek a fourth term in the State Assembly to promote the future development of Green Bay and restore civility at City Hall. 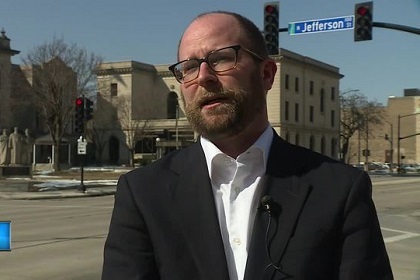 GREEN BAY - Local progressive leader and current State Representative Eric Genrich (D - Green Bay) announced in a statement released Monday that he will run to replace Jim Schmitt as City of Green Bay Mayor. Schmitt announced last fall that he would not seek re-election. He has been mayor since 2003 and has sought to improve and modernize Wisconsin's third largest city, most notably downtown. He has come under fire recently by several aldermen, including Guy Zima, and has said he would consider re-entering the race if he wasn't happy with the candidates. "These last few months I have spent a lot of time talking with family, friends, and community members about the prospect of my run for mayor," Eric said in his statement. "As a result of those encouraging conversations, and because of my continued commitment to public service and my love for this city, I am announcing my candidacy today." Genrich has served the people of the Green Bay area in the State Assembly for the last six years, having won three straight elections in District 90. He announced Monday that he is stepping down for that post in Madison to come home to take on the challenge here. "I am simultaneously announcing my decision not to seek reelection to the state Assembly. I make that decision with mixed emotions, recognizing how much work remains to be done," Genrich said. "But I also never intended to make a lifelong career of legislative service. 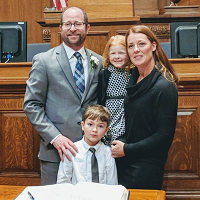 At the end of my term, I will have served the people of Green Bay for six years in the legislature, which has been the honor of my professional life. I am proud of my record of advocacy and bipartisan accomplishment, and I plan to carry forward with that spirit into the future." Genrich is the first announced candidate to replace Schmitt, but several current aldermen have been rumored to be interested in a run. Prospective candidates for the District 90 seat are also beginning to surface, including Brown County Supervisor Patrick Buckley. Buckley is a retired Green Bay police officer and businessman who franchises Subway restaurants in northeastern Wisconsin. Schmitt's current term will end in 2019, and Genrich is taking on a year long challenge to replace him. "As I begin this campaign, I want to make it clear that this race will not be about one person or a collection of candidates," Eric says in his statement. "Instead this effort must be about the people of Green Bay - people in every corner of the city and from all walks of life. During these next twelve months, I will talk to my fellow citizens in every neighborhood, listen to the hopes and dreams they have for our community, and give voice to those ideas as best I can." "I am a proud son of Green Bay who deeply loves our community’s story," Genrich concludes. "I’m ready to help write the next chapter, and I ask my fellow citizens to join me."